What inspired you to write The Crowns of Croswald? I have always found joy in being creative, art projects and things like that. But more than that, I’ve always loved stories, mostly my favorite animated movies. I’m a Disney fanatic. My draw toward fantasy and my creative drive sort of forced me to start writing. For me, it’s not just about the writing, it’s about creating characters, designing scenes, and imagining everything and anything magical. Croswald is basically me in a book––fairy tale with an edge. I love fashion, fairy tales, anything that sparkles, and I especially love magic. What was your favorite part about creating the world of Croswald? I’m so grateful to be one of those people that really truly loves what they’re doing. My favorite part of this whole experience is seeing pieces of my world come to life, whether in the form of illustrations or being able to hold a physical book in hand. It’s like a dream. I also love the process of creating characters and naming them. I have a lot of fun with that. Tell us more about creating a character. What sort of process do you go through? Well, I don’t know if it’s a process exactly. It always seems sort of like random inspiration. For example, eating dinner beside my 11-year-old brother who loves butter and bread. Emphasis on the butter. Readers get to meet Woodley Butterlove and understand how my little brother inspired such a character. Ivy is a strong, inspirational character. How do you think she grows throughout the book, and what would you like the reader to take away from that? I think a lot of people’s natural talent is hindered by self-doubt. I think for Ivy Lovely, the first book is all about discovery and uncovering her hidden talents. It’s all about taking that first step and trusting your gut. I like to think that her first stride across the slurry fields may speak to a reader waiting to take the first step in their own adventure. Everyone should get the chance to step into something magical. As a debut author, what surprised you most about the writing process for The Crowns of Croswald? Probably my patience. I think people often get deterred by the time it takes to complete something. It’s taken me three and a half years to get to this point and I was surprised by how calm I was throughout the whole process. Excited, but calm. This is the first book in a series. Without giving too much away, what do you have in store for your readers as the series evolves? Of course, readers will get to join Ivy on her adventures of discovery through Croswald, full of weird and whacky character. Also a lot of magic and new inventions. The final show down with the dark Queen is going to be spectacular! Your love of magic and fantasy is apparent in your writing. How did your love of magic develop? I spent every birthday visiting theme parks with my best friends. My mom would pick us up early from school and we’d spend a day in a place of total imagination. That world of fantasy seemed so vibrant and I always dreamed of creating a place one day where people can visit. When I wrote, I always wrote keeping that in mind. Where can people visit? What can they see when they go there? Like I said, I love being creative and writing a book seemed the perfect fit. Besides being a Disney fanatic, I love that, with magic, anything is possible. 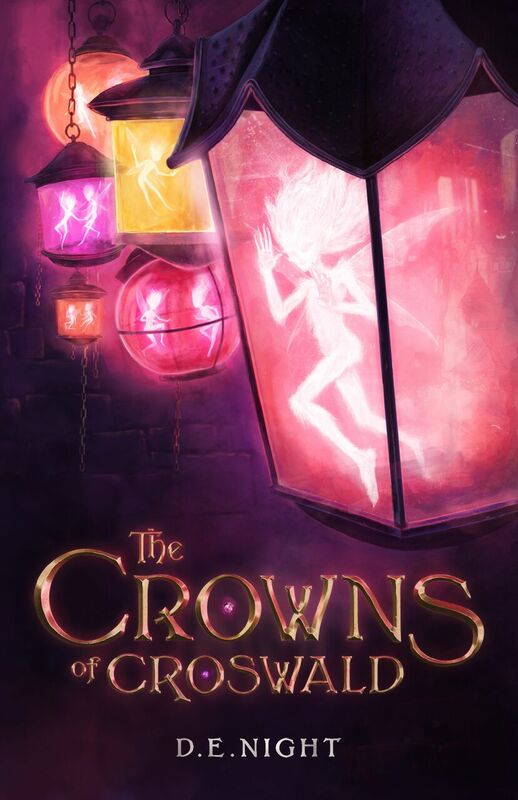 The Crowns of Croswald follows the adventures of Ivy Lovely, a strong heroine who is full of spirit and unwavering courage. Can you tell us more about her and how her character came about? The reader meets Ivy when she’s unsure, held back, and lonely. Through the course of The Crowns of Croswald, we get to see Ivy become who she is meant to be: impulsive but smart, studious but adventurous. She doesn’t know it yet, but those are the very traits that will save her kingdom. She trusts her gut and that gets her pretty far in life, but she learns to ask for help along the way. Most importantly, she’s compassionate and funny: two must-haves in any friend, in my opinion. If you could give readers one message to inspire them from your book, what would it be? Believe in the magic of your dreams.